"The Ancient Indian Wisdom website development is still not complete. This is a beta-launch to get the wealth of authentic articles in front of our avid readers and scholars. Currently, media, images, videos development along with article updates is underway. Please pardon any discrepancies in the mean-time and check back for frequent updates and new articles"
Pre-Vedic, Vedic, and post Vedic timeline. 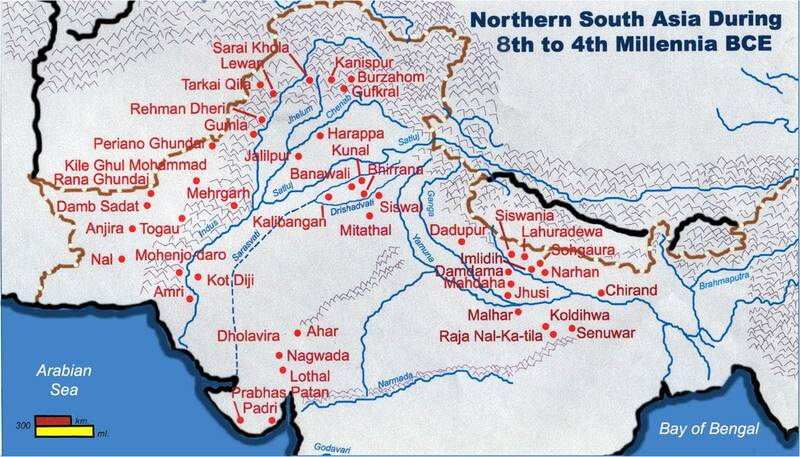 Indus Valley and Sarswathi River civilizations. Summary of major streams of evidence. Overview, structure, main focus of Vedas. Review of study tools called Vedangas. Detailed write up of Vedas. Portrayal of the rich tapestry of ancient Indian culture and its evolution. Illustrated with audio-visuals with thematic articles. Vedic concept of wellness and health based on holistic living. Overview of Ayur-Veda the science of life. Traditions, practices and other facets of Indian traditional life. Precepts and Practices. Acceptance and application of Yoga in various forms across the world. The essential fabric of Hinduism. Welcome to Jijnyasa Website, a portrayal of Ancient Indian Wisdom with sound, sight and words. We are taking you across the frontier of time to an ancient civilization in the Indian subcontinent on a voyage of discovery. We present here as an introduction to our web site a brief outline of the structure, contents and overall focus of the various themes and sub themes that you will encounter in this voyage. The Sanskrit word Jijnyasa (Jnatum icchaa) – means desire to know, which is a basic quality of human existence. As philosophers say “I think therefore I am!” Jijnyasa leads to finding answers to a number of fundamental questions. For most of us, the answer is everything that comes into our human experience: life, feelings, emotions, objects, the world, who we are on this planet, Earth? And, why? All living beings, including animals probe and survey their surroundings to know their environment, with a natural curiosity. Humans have reached a higher plane of curiosity in probing the secrets of nature. The special quality of seeking knowledge that the human race has acquired through evolution is abstract thought, or the probing of the world of ideas. This is what makes human race unique and all civilizations worthy of study. We find in their legacy arts, architecture, writings, musings, inventions, dwellings and habitats, and a body of thought, or philosophy through their footprints on sands of time. Ancient Indian Civilization, amongst other world civilizations is the oldest and is distinguished by its profound thought and wisdom. This civilization is identified as the Vedic Civilization, Sindhu-Sarasvati civilization and Aryan civilization. While other ancient civilizations reached their zenith and disappeared from the pages of human history, the heritage of ancient Indian Civilization continued endures and continues in its living tradition in India. In the contemporary world, it is popularly identified as Hinduism. The foundation of the Vedic civilization was laid by sages or seers, Rishis, whose vision penetrated deeply into the humanity’s perennial questions, but did not stop at these mundane inquiries. They explored further in to the meaning of natural laws, the nature of spirit, the origin of the universe, and what is beyond the cycle of life, birth and death, the relationship between body, mind, intelligence, soul, and spirit. Their vision touched on the nature of divinity, the supreme coordinating power that may underlie natural laws. In short, they aspired to know everything that the mind can comprehend—from the atom to infinity, the creation of the universe, and its meaning. The origin of various branches of science, art, and philosophy attributed to this civilization are truly remarkable products of its Jijnyasa, or desire to know. Our focus here is to explore and portray ancient Indian thought, and its wisdom acknowledged worldwide, including its relevance for our modern age. This exploration is presented under various themes. A special section on the nature and contents of Sanatana Dharma is included as a part of this web, as it summarizes the very gist of ancient wisdom. The contents of our web site come from many sources. Experts and scholars from India and abroad have contributed, as a team, to the various themes. We have also drawn from outstanding web resources and relevant published literature. The first theme examines its History and Timeline. 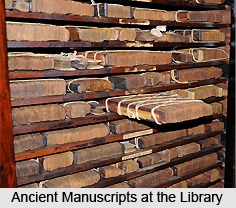 Articles cover various aspects of the Indus and Saraswati river Valley Civilization. The Sarasvati river mentioned in Vedic literature mysteriously disappeared in the course of History and its story is recounted by authentic articles by research scholars. The Sarasvati river valley civilization is now established through satellite photography and sites discovered by archaeological research. These include together with the main Harapan site many important ones like Dholavira. The articles cover the continuity of this civilization through the sites at Magadha, and sunken city of Dwaraka. These sites have yielded fascinating information on the widespread trade, people movement, their art and culture. Indeed they furnish evidence that the civilization was remarkable advanced in comparison with its contemporary civilizations. Historical distortions that occurred during the colonial and previous era have now stand corrected by the new emerging evidence. The contents of this theme are enriched by scholarly and pioneering research works by Dr. S. Kalyanaraman, Michael Danino, B. B. Lal, SrikantTalageri, Mahadevan, Agarwal D. P, Deo Prakash Sharma, Rajaram, Koenrad Elst, Allchin, Casal Jean-Marie Casal, Elstov Pitor, Jane R. Mcintosh, Bryant Edwin and many more. The Mohenjo-Daro, Harappan and associated archeological finds belong to the civilization identified in the Vedas as the Sindhu Sarasvati (Indus-Saraswati) Civilization—the Vedic Civilization. The people of thiscivilization who gave the world such treasures as the Vedas, Upanishads and the great Bhagawad-geeta, were natives of the land, and did not come to the Sindhu Sarasvati basin as invaders. 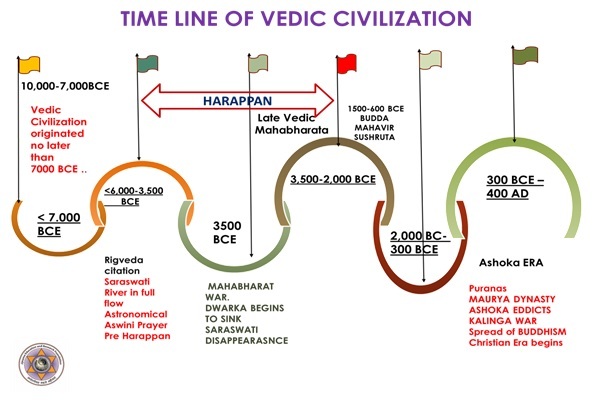 While the chronology of a part of this civilization overlaps the Harappan era (between 3800 and 2100 BC) the oral tradition of the Vedas preceded this phase by several millennia, starting no later than 7000 BC, and possibly earlier. Impartial appraisal of linguistic evidence, astronomical projections with newly developed software, paleontological evidence, satellite maps of the Sarasvati basin, and a total insight into what constituted Vedic culture and its doings, support this conclusion. The controversial theories developed during the colonial era, assigning 1600 BC as the earliest period of Vedic thought, and still persisting in the writings of certain Western scholars, finds no validity in these studies. While no final clarity on the dateline issues has been reached, and further intensive archaeological and other studies of vast territories are needed, we can reasonably conclude on the basis of scientific evidence now available, that the origin of the Vedic tradition began not later than 7000 BC. The second major theme, Vedas and Vedic System, examines the vast array of source books of the Vedic system forming the foundation of ancient Indian thought. It highlights the message and meaning of Vedic sourcebooks: The Vedas, Upanishads, Brahmasutras, and the major Puranas, the Mahabharatha, Ramayana, Bhagavatham, Pancharatraaagama, and major systems of Indian philosophy, and also includes links to the Bhagavad-Geeta, since this is regarded as the quintessential summary of all Vedic source books. Works on Dharma Shastra, and other major works like Artha Shastra and Niti Shastra are also included. The theme includes works of the modern rishi-saint, Sri Aurobindo, concerning symbolism in the Vedas. This section also explores the life and works of Indian saints who, through their poetry and songs, carried the teachings of the Vedas to society in regional languages. Contributors to this theme include Dr. Kashyap, Professor Korada, Dr. Sampadananda Mishra, and others. Over the centuries, a voluminous literature has accumulated on the Vedas, written in English and many other languages. Yet the Vedas remain elusive, as they are written in symbolic language that lends more than one meaning. None of the three great acharyas, Shankara, Ramanuja, and Madhva, who explored every other ancient Indian sourcebook, wrote full commentaries on Vedas. This fact is significant, and adds further mystery to the enigmatic Vedas. (Shri Madhva did write a short Rigbhyasya, but it addresses only some parts of Rig Veda, unlike his voluminous commentaries on Upanishads, Bhagawadgeeta, Brahma sutras and the Mahapuranas). The main commentary on the Vedas, which most of the Eastern and Western writers rely upon, Sayana Bhashya, is by Sayana Madhava, popularly known as Sayanacharya. This voluminous work is appreciated world over for its encyclopedic coverage of Vedic texts; it is essentially a literal translation of the Vedas. Its critics lament its lack of reference to the hidden meanings of the Vedic tenets, as well as its silence on the symbolism of the Vedas. This is one of the reasons why the Vedas remain inadequately illuminated. Another reason is that Vedic Sanskrit is different from classical Sanskrit, the language currently taught, written and sometimes spoken. It is not only the mother of the current version of the language, but the mother of a widespread group of languages, the proto-Indo-European languages. The meaning of the Vedas is not easy to discern and comprehend, partly due to the system of symbolism common to many Indian sourcebooks, making the real import far removed from the literal meaning. This led to a number of writings such as those of Aurobindo, the great, modern sage—particularly his Secret of Vedas, and Symbolism of Vedas. One of the great pioneers in this field was Kapali Shastri (1886–1953), a highly respected Vedic Scholar, who was associated with Aurobindo. This theme includes references as well as some samplings of these modern seers. The Rishis provided the Vedas with study tools or Vedangas, the limbs of the Veda. The understanding of the Vedangas is a necessity for the comprehension of Vedic texts. There are six Vedangas: Shikhsa, the science of pronunciation; Vyakarana, the grammar; Chandas, the prosody and poetic construction; Nirukta, semantics; Jyotisha, astronomical science; and Kalpa, the technicalities of rituals. Professor Korada has contributed introductions to all the Vedangas. Scholars, Dr. R. L. Kashyap, Dr. Sheeba, Dr. Sampadananda Mishra, Dr. Narasimhan, and Dr. Jayashree, and others, have provided a variety of articles on other Vedic texts, including the Upanishads, Brahma Sutras, and Puranas. Bhagavad-Gita is well known as the most revered source book of the Vedic literature. It is not merely a master key to all Vedic doctrines, but a life companion for anyone who seeks vibrant, divine guidance. It is a friend, philosopher, and guide in this life, and beyond. 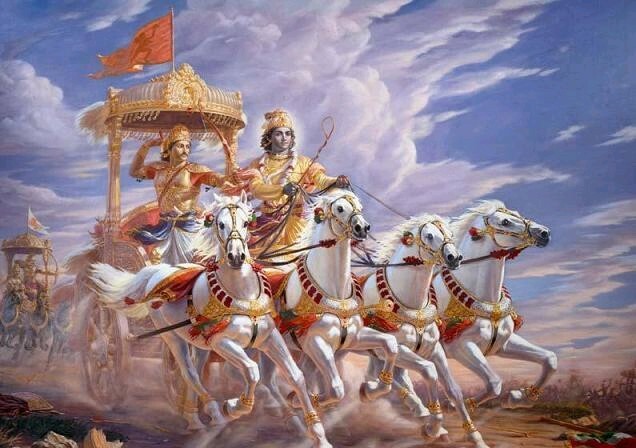 In view of the paramount position of Bhagavad-Gita in Vedic System, our web site contains a special serialized section entitled CONCEPTS IN BHAGAVAD GITA, as a part of Vedic System. In a website of finite limitations it is not possible in summary, to do justice to its age-old wisdom, neither the brilliance of its conception, nor the genius, and almost infinite comprehension which it offers to our generation. What we provide is just a glimpse of its revelations which Hindus consider their sourcebooks, Shrutis (wisdom derived from oral tradition from generation to generation without known origin, or just revelations). These are considered to be apaurusheya (not of human authorship). Intellectual Heritage focuses on the ancient language, Samskrit, unique amongst languages of the world, often aptly termed, the mother of all languages. Despite its origin several millennia before the Christian era, it is still a living language, as its immense literature is studied by scholars and researchers, worldwide. Vast and colorful, its incomparable poetry and prose was produced by the inspired genius of literary giants such as Bhasa, Bhavabhuti, Bharavi, Bana, Dandin, Magha, the supreme poet, Kalidasa, and the like. Samskrit, based on its unique merit, has caught on in countries beyond India, and has been introduced in schools in Ireland, England, and the United States. Whether one reads a product of its intellectual heritage, like one of the poetic works, or a product of its spiritual heritage, like the Upanishads, one cannot fail to perceive and enjoy the elegance, rhythm, and natural poetry of its composition. Even its dictionary and grammar are composed in poetry. Included in this theme is a stand-alone sub-theme, Subhahsitas, or poetic aphorisms of practical wisdom. The theme, Culture, describes the rich, colorful, and captivating life and doings of the people of this ancient civilization. It presents a living and vibrant people who, while enjoying a multifaceted life, were focused on the true meaning of life and beyond. This theme portrays the art, architecture, drama and dance, various festive customs and traditions, music and paintings, and more. The content of this section is contributed by Prof. Choodamani Nandagopal, Jain University, Bengaluru, and Dr.Deggulkar, former President of Deccan College, Pune, among others. This section is enlivened with videos, pictures, and photos. Health, Wellness and Ayurveda: Ancient Indians accorded great importance to health and wellness derived from the practice of Yoga, and applications of the Vedic science of health, healing, the science of knowing life-span is called Ayurveda. The importance of health was emphasized by ancient seers as Shareeramadyam khalu dharma-sadhanam. The basis of all life’s endeavors is Swasthya (a sound body), the epitome of perfect health, which is prerequisite for attainment of spiritual enlightenment. The entire lifestyle in ancient India embodied, and aimed at achieving physical, mental, spiritual, economic, and social wellbeing to be enjoyed over a hundred autumns. Jeevaamasharadahshatam was the Vedic prayer chanted by everyone. 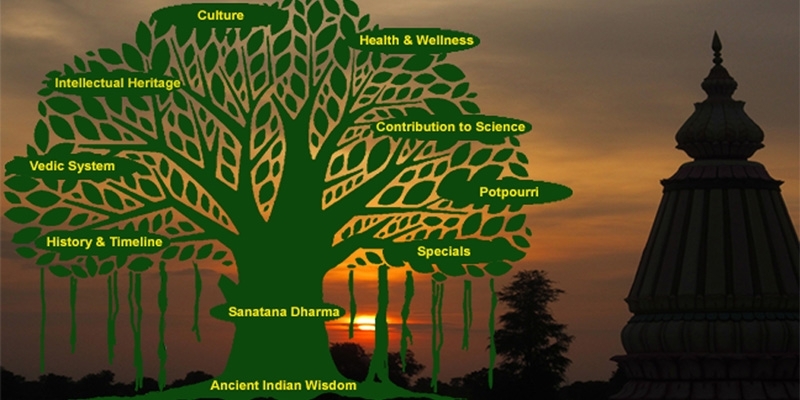 The science of Ayurveda (Ayurvedic medical science) based on the great texts of Charaka (300 BC), Sushruta ( 700 BC), Vagbhata (700 AD) are briefly highlighted as one of the subthemes. The contents of this theme are compiled and edited jointly by Dr. Bhushan Patwardhan, Pune, India, and Dr. Gururaj Mutalik. Yoga. Several articles attempt to explain the full spectrum of Yoga. Yoga is one of the most important contributions that India has made to the world. What is Yoga? Classically described as the melding of body and mind, Yoga is a routine of harnessing the internal energies of our body and mind to reach perfect harmony that will elevate our quality of life to incredible heights. It was taught as a discipline that involved both physical routines, and meditation to build the body, and to evolve the mind to empower us to live purposefully, and to reach a plane of simple living, and high thinking. The word Yoga harmoniously blends with the way of life that our ancient forefathers have passed down to us. The Bhagavad-Geeta teaches us Karma yoga (discipline of duty), Jnana Yoga (progression of our knowledge), and Bhakti yoga (surrendering ourselves to the Almighty), as a trinity of means to live a life with a purpose and meaning, and attain self-realization beyond life. Yoga and yogic teachings in many colors and forms have spread beyond the borders of India to other parts of world. Buddhism played a significant role in this spreading of yoga. Terms and practices such as mindfulness, transcendental meditation, and many forms of yoga described with various epithets, are practiced in different countries and communities. Many of the world’s top medical facilities and hospitals provide yoga practice centers for the alleviation of their patients’ ailments. Dr. Vinod Deshmukh has specially contributed an article, “Patanajli’s Ashtanga Yoga: A Neurologists Perspective”. Dr. Alex Hankey, a distinguished disciple of Maharshi Mahesh Yogi, has contributed an article on Transcendental Meditation. Sri Raghuram, chief of the Yogabharati international movement has contributed an article on Yoga. The presentation of this theme is based on many authentic, traditional, and modern resources, including Patanjali Yoga sutras, scriptural texts, and writings of many Yoga pioneers from India like Maharishi Mahesh Yogi, B.K.S. Iyengar, and most importantly, the Bhagavad-Geeta. This page contains essential concepts drawn from major source books including Upanishads, Mahabharata and other scriptural texts. Stylistically, it is modelled on the presentation under important concepts in Srimad Bhagavad-Gita, which is included separately, because of its philosophical pivotal place under major theme Vedas and Vedic system. This section also includes presentation related to Samskaras, which deals with important milestones of life. Our ancestors designed ingenious landmarks involving ceremonies and prayers to mark key transitional stages in life. These have evolved as ceremonial processes, and continue to be observed in orthodox themes of Hindu society today. First is the ceremony of namakarana, which is the giving of a suitable name to the newborn within ten days following birth. There follow several events: jatakarma–annaprashana, first solid feed to the child in the third month; karna-vedha, ear-piercing in the sixth month; choodakarma, first hair cut at one year; and Upanayana, wearing the holy thread, and initiation in first Vedic prayers (eighth year). This is when a boy between the age of eight and ten is initiated and introduced to the Vedic way of living. The highlight of the ceremony is when a preceptor, usually the father of the batu (boy), whispers the holy Gayatri Mantra into the ears of the boy, and gives him the gift of the holy thread of triple strings tied in one knot, known as Brahmaghat. From that day until his wedding, the child is bound by the discipline of brahmacharya, or celibacy; tapas or meditation; living a virtuous life; and commitment to regular studies. The Indian wedding ceremony consists of several components: the Wag Nischaya, a verbal agreement between families; the ceremony, with its important components, like Akshata (blessings bestowed by Gods); the gathering of friends and family; the seven-step, meaningful ceremony; and certain homas (offerings to Gods through a fire box, or yajna). Two articles by our contributors give details. Other samskaras are explained in these articles. While the samskaras are conceived as landmark events creating a climate for enabling and empowering a person for his or her optimal growth and development, other colorful festivities on specific holy days are important community events, bringing together all community members, and allowing resolution of disputes. These include the birthdays of Sri Rama and Sri Krishna; Dasara-Navaratri; Deepavali, the festival of lights; and Holi, the day of colors. These are presented in our special infomercials interspersed with videos. The web site contains an important article under Sanatana Dharma as a major theme for readers to peruse. It summarizes the essential concepts of Ancient Indian Wisdom. Indeed Sanatana Dharma, also called Shashwata Dharma is comprised as a set of principles as a guide to meaningful day to day life based on righteous thinking. It is called Sanatana, for it is eternal at all times, situations and uplifts life for all. We commend the reader to read this article as a summary of the entire purport of the web. Contribution to Science from Ancient India: There is a commonly held notion that the Ancient Indian Civilization excelled in philosophy and metaphysics, but made no great contributions to science. Nothing could be further from the truth! Ancient India contributed profusely to the early development of science in many important fields such as mathematics, astronomy, chemistry, geometry and trigonometry, and medical sciences. It is pertinent to note that due to the vicissitudes of history—invasions, conquests, colonization, internal wars—and a proclivity to spiritual rather than the physical matters, the industrial revolution of the seventeenth to nineteenth centuries eluded India largely because it was under colonial rule. This theme is contributed by Professor Alok Kumar, a noted scientist in physics, from New York State University at Oswego. His article is a summary, specially written by the author based on his recently published, widely acclaimed work, Sciences of the Ancient Hindus. An attractive graphic presentation on the subject authored by Michael Danino complements this article. Potpourri: Under this theme miscellaneous sub-themes are presented to highlight many colorful traditions, practices and other facets of Indian traditional life. These include regional talent arts, festivities, temple worship, public ceremonies and celebrations which have evolved over a course of time, but were rooted in the traditions of ancient time. This theme is presented as a visual content-rich infomercial. This section also contains writings on Hinduism – a World view. Much as the world appreciates the antiquity and profound wisdom contribution of Ancient Indian Civilization in its checkered history, this civilization also has been maligned, distorted, and slighted by prejudiced thinkers and writers during the country’s colonial past, as well as today, including some who profess to be experts in Indology. While it may be judicial to ignore such critics and biased thinkers, we thought that the facts related to such perversions of history need to be rectified, and explained to the readers. To this effect, in the special theme, entitled “Hinduism—A World View”, through invited articles and Op-Eds, this subject is researched, and briefly reviewed. Special sections contains Blogs, Op-ed’s, readers views, Questions and answers, list of reading resources and references for further study for our readers and for scholars to delve in to the subjects deeper. The website is designed to be dynamic and will be further developed as we go by. We have plans to serialize detailed scholarly and popular articles using web platform and forums to cater for wide call of readers and use the power of Digital technology for easy assimilation and comprehension. In this regard, the feedback from readers is sought. It is a long journey that we have attempted to cover from several thousand years before the Gregorian calendar era and its impact, and its evolution until today. India has been described not as much a country, as a continent. The culture of this continent while derived from a civilization whose language was Samskrit, termed as the language of Gods , it also received vital and precisions contributions to its making from the coexistent Dravidian and other native cultures. Its traditions as we noted has endured. In constructing this work and enduring with you this arduous memorable journey, we feel uplifted. We hope that ‘You’ as the reader and providers of valuable feedback to us, feel equally inspired. As they say in Samskrit ,’Shubhashte PanthaH’– Let your journey be blessed and rewarding. Let us never harbor any hatred within us. May there be abundance of peace in the world.